There are many possible causes of plantar fasciitis. The key to having success with treating plantar fasciitis is using the treatment that addresses the specific cause(s) that you have. Let’s start with a definition of plantar fasciitis (PF) and some common treatments. From there, let’s return to the concept of what can cause PF. Once you know the potential causes, you’ll have a much better idea what kind of testing is needed to diagnose your particular version of plantar fasciitis. PF translates to “an inflammation of the connective tissue on the bottom of the foot”. Commonly, the term is used when referring to inflammation in the specific area where the Flexor Digitorum Brevis (FDB) muscle connects to the calcaneus or heel bone. This is the region on the bottom of the foot, just in front of the round callous of the heel. Inflammation is a normal body response to any type of stress or damage: mechanical, chemical or thermal. If the amount or frequency of damage exceeds your body’s rate of repair, you will accumulate inflammation and pain. The inflammation and pain can last for a few minutes at a time to continuously depending on how much of an imbalance you have between your foot stresses and your repair rates. Stretches, anti-inflammatories, analgesics, orthotics, various neuromuscular movement retraining techniques, ice, heat, physiotherapy, change of foot wear, weight loss, etc. are all effective for various people depending on which cause of PF they have. To increase the chances of a particular therapy being successful in your specific case, it is essential to diagnose which cause or causes of PF you have. Let’s look at some of the possible causes with this in mind. Excess stress – If your foot is used to x number of hours of weight bearing for years, your tissues will build themselves to tolerate that amount of stress. If you then do some activity where you are weight bearing for a much longer period of time, the tissues can be overwhelmed by the extra work and get ripped to some degree. Vacation trips involving amusement parks, hikes or walking excursions when you have a sitting job all week are classic examples of this type of stress. Abnormal footwear stress – Improper shoes can distort your foot biomechanics out of their normal, correct position. For example, a shoe which has an uneven base or crooked heel cup, will push your foot so that weight is borne by tissues that do not normally experience this amount of stress. Excess body weight – will damage tissues at a faster rate than if you are lighter weight. This in itself should not pose a problem if all other biomechanical factors are working correctly. It is more likely to be a problem however, if the weight is gained rapidly or multiple factors are involved. Foot pronation – weakness of any of the muscles that hold up the long arch of the foot will result in force being exerted on the FDB in directions that the muscle is not capable of handling. Muscles that help hold up the long arch include the posterior tibialis and anterior tibialis. Substitution – The flexor digitorum longus overlaps in function to some degree with the flexor digitorum brevis that is involved with PF. If the longus muscle is weak, it will shift extra work onto the much smaller brevis muscle, exceeding its’ capacity and causing damage. High arch – If the muscles which hold up the long arch of the foot are too strong, the arch will be too high. If persistent for too long, the plantar fascia and FDB will contract as an adaptation. Should the foot be placed under any type of stress that causes the arch to fall back to it’s normal height, the plantar fascia will be stretched excessively and damaged. Any foot/calf muscle imbalances – Foot pronation, substitution and high arches can all be caused by muscle strength imbalances. Many other variations of muscle imbalances exist that will place extra stress on the plantar fascia. For example, people with a history of ankle sprains frequently have a residual weakness of the fibularis muscles that cross the ankles. These people will have ankle stability issues that put abnormally high strain on the plantar fascia. Improper weight bearing technique – people who stand or walk incorrectly will place unusual stresses on their plantar fascia. This can be the result of posture habits, congenital nerve development issues or injuries. Other – Strength imbalances and technique abnormalities happen for a reason. Determining what the reason for these imbalances is the next step. Is one of the muscles causing PF weak just from lack of use? Perhaps an old injury that was not rehabilitated fully? Perhaps there is a low back problem putting stress on the nerves that control the muscles affecting the foot region. Rarely, there will be a bone that did not form correctly at birth or heal correctly after a fracture. These and many other causes can put abnormal stresses on the mechanics of the foot. Essential nutrient deficiencies – Repair of the day to day stresses on your body requires a constant process of building muscles, connective tissue and tendons, etc. If your dietary intake of any of the essential nutrients used in making these tissues is too low, you will not be able to repair the daily damage. Over time, even a perfect foot, used perfectly with proper biomechanics and footwear, will experience problems as tissue repair does not keep up with the normal tissue turnover from use. Toxic accumulations – various poisons and drugs will interfere with tissue repair directly or indirectly. They can also accelerate the rate at which you utilize certain essential nutrients. Circulation – When blood flow is decreased to any region, the rates of repair will start to decrease as well. Causes of decreased blood flow can be as simple as excessively tight muscles compressing veins to atherosclerotic plaques blocking arteries. Checking pulses and temperature in the feet is a simple way to get an approximate sense of your circulation. Diabetes – interferes with circulation, particularly in the lower extremities. Decreased blood flow can become so severe that tissues die from lack of essential nutrients and waste removal. Decreased delivery of sugar as fuel for the cells that repair the daily damage also contributes to foot issues. It takes detective work to uncover all of the factors that can be involved in causing PF for each person. In addition, each factor that a person has involved, can be contributing a different percentage to the overall condition. For example, 2 people with PF as the results of a posterior tibialis weakness and a vitamin C deficiency. Person one might have 90% of their problem from the weak posterior tibialis while the other person has 90% coming from vitamin C deficiency. To get success with these 2 people will require very different treatment approaches. To increase your chances of curing PF permanently, it is important to consider as many possible causes as you can, prioritize the treatment approach and then begin therapy. A stretching protocol may be great for one person, foot orthotics for another, corrective muscle exercises for somebody else and nutritional treatments…you get the point. It is important to resist the urge to experiment with one therapy or another. This is even more important with therapies that primarily address symptoms rather than causes (pain killers, anti-inflammitories, ice, heat). This type of piecemeal or symptomatic approach increases the chance of only addressing a small part of the problem while other contributing factors remain unaddressed. It is these unaddressed factors that can cause another health or athletic performance issue at some time in the future. Typically, the longer any factor remains untreated, the more significant the health issues will become when they do emerge, and the longer they will take to correct once discovered. The DxF currently has programs to teach health care & athletic providers how to test for one potential cause of plantar fasciitis. 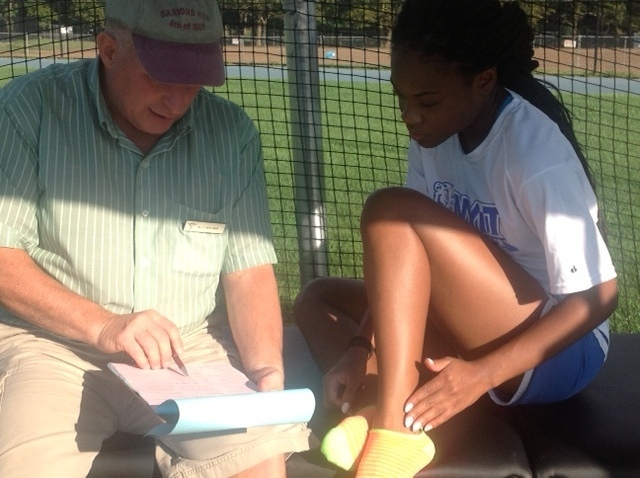 More information on testing foot biomechanics and muscle imbalances is available here.